If you go into Billy Goat uninformed, you could be setting yourself up for some serious disappointment. If you were to take a page out of the classic SNL skit and just say cheezborger, well, you’re going to get mostly bread. The cheese and burger part of the equation will be hardly noticeable, which isn’t good. There’s a simple solution though. Order the triple, pictured above. Yeah, it seems excessive, I know. But it’s still less than a half pound of beef, and it’s darn good. It’s three 1/8 pound patties with two pieces of American cheese on a hearty bun. It’s a very hearty bun, light and puffy yet pretty chewy, so it doesn’t break down under the juices from the three patties. I was pleasantly surprised. Enough with that, man. I took my brother-in-law and two nephews here and they loved it. The guy behind the counter was yelling “dobolo cheeburger” and the grease was sizzling. Even though it was Navy Pier, it still felt kind of classic. And now my brother-in-law can tell his friends in Denver he went to the Billy Goat, which John Belushi and Mike Royko made famous (kind of, I guess, even though it’s not the original). He can show them the video and yuck it up about the Curse, because it’s Chicago baby. For real. I liked it too. 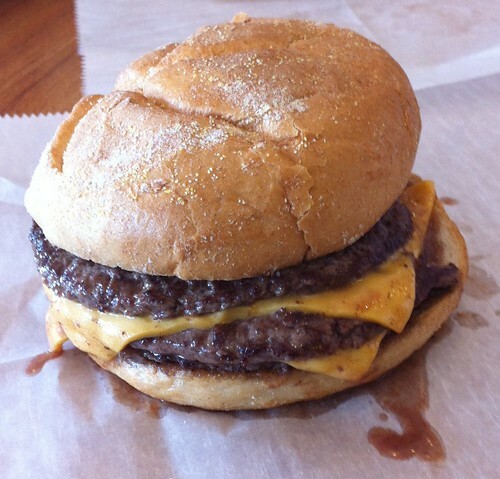 The triple was just the antidote for a warped bun-to-burger ratio. Posted in food, tagged burgers on 2012/01/17 by John.